Could The Walking Dead creator Robert Kirkman be seriously considering killing off one of the TV shows most popular characters to prove that no one is truly safe? That’s the hint that Kirkman appeared to be dropping on a recent appearance on CNN. On Friday, CNN’s Gustavo Valdes quizzed Kirkman on if it was difficult to kill off characters on The Walking Dead. Kirkman explained that in the comic it wasn’t any big deal because him and the artist would just decide that they didn’t want to do the character anymore, but with the TV show, it’s more difficult because there’s an actor involved. “You get to know the actor, and you see the house that they bought in Senoia, Georgia for filming. And it’s like, ‘Oh, they’re not going to live in that house anymore.’ That’s awkward,’ said Kirkman. 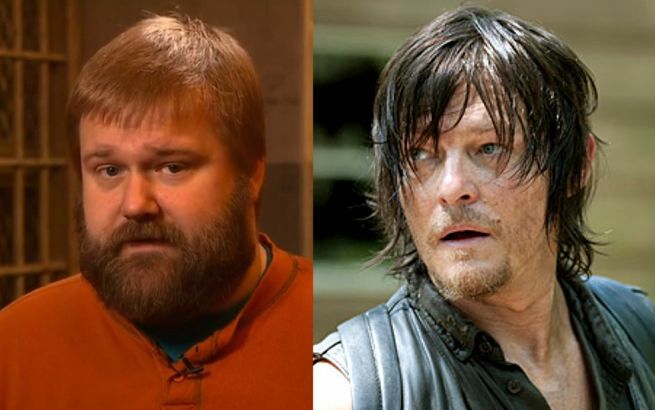 After Kirkman explained the strict protocol that the show went through in telling the actor involved they were being killed off, Valdes asked if anybody was safe on the show. And Kirkman delivered an answer that will likely send shivers up the spines of Daryl Dixon fans. “No, no one is safe, definitely not. Looking at you Norman Reedus,” said Kirkman. The Walking Dead Season 5 returns on February 8, 2015 on AMC.